I don’t usually think of LA as a splendid place for Indian food, but in fact it is. The specialty here is Keralan, and that is what you should order. Go to the Keralan section of the menu and get all eight or so dishes there, or fewer if you are alone. The vegetables are superb, the biryani too. I don’t know of any place in North America better for Keralan food. The buffet looked fine, but I doubt if that is your optimal strategy here. Plus it is in a lovely strip mall. And what about the food? It may be the best restaurant in Washington right now — and it was the second-best sushi meal I’ve had in America, behind only Masa, the Michelin three-star temple in Manhattan. Sushi Nakazawa flies in lots of sushi from Hokkaido, a premier source of supply, and the presentation is impeccable. If I have a complaint, it is about the décor and atmosphere: the tacky carpet, highly visible fire alarm and annoying muzak were all magnified by the absence of human beings in the main dining room. The room is ugly without being informal or relaxing or culturally interesting. How much money did I funnel to the pockets of Trump? I don’t know the details of the restaurant’s contract with the hotel, but unless business picks up, I suspect I was merely limiting its losses. Still, there is a small chance that my single meal — or maybe this column — nudges its operators into extending their lease. Then again, if a sushi restaurant is a worse fit for the hotel than, say, another bar or steakhouse, I could just as easily be helping to keep the hotel’s profits down. I don’t feel I have committed a utilitarian sin. Before we go any further, please note this is TAKE-OUT ONLY. And there are no benches nearby, so do give some consideration to this problem before visiting. That said, this is some of the best Peruvian food around. It is probably the most authentic, and they have the broadest menu, and excellent ceviche. The meat in the lomo saltado is a little tough, but the fries, sauce, red onions mix is my first choice in this area. The seafood and rice dishes are quite good, too. So I’m going to really like this place, and some of you will too. But they don’t make it easy in every way either. Posted on 2018/08/19 by . Seherli Tandir, in Baku, Azerbaijan is now on my list, but let me first explain the criteria. This is not about the best restaurants, it is about the ones that give you the most consumer surplus. For most of the “next door restaurants,” as I shall call them, you want them to be inexpensive, to offer some healthy options, to satisfy some of your cravings, to offer unique dishes, and not to take too long serving you. It is not a mistake, if you are visiting Baku, to simply have each and every one of your meals at Seherli Tandir — the other restaurants in town are dominated assets. The menu allows you to order three different types of cherry jam. Get the one in the middle, the sour one (don’t let them tell you that you should not be ordering a jam, and don’t put it on anything, just eat it). Have I had better yogurts and rices? Order the little dumplings with sumac (gurza), asking for yogurt sauce on the side. The qutabs — thin breads stuffed with either pumpkin or meat — are the surprise knock-outs. The soups, the stews, the dolmeh. Did I mention the pilaf with the chestnuts? The “tandir” bread-baking oven in the middle of the restaurant? The typical entree costs about $4-6. And the staff is friendly and helpful. In general, Azerbaijani food lies in the space between Persian and Georgian cuisines, a double yum. Which other restaurants should be in the top ten you want right next to your home? And why aren’t those restaurants simply the best period? p.s. watermelon jam tastes better than you think. 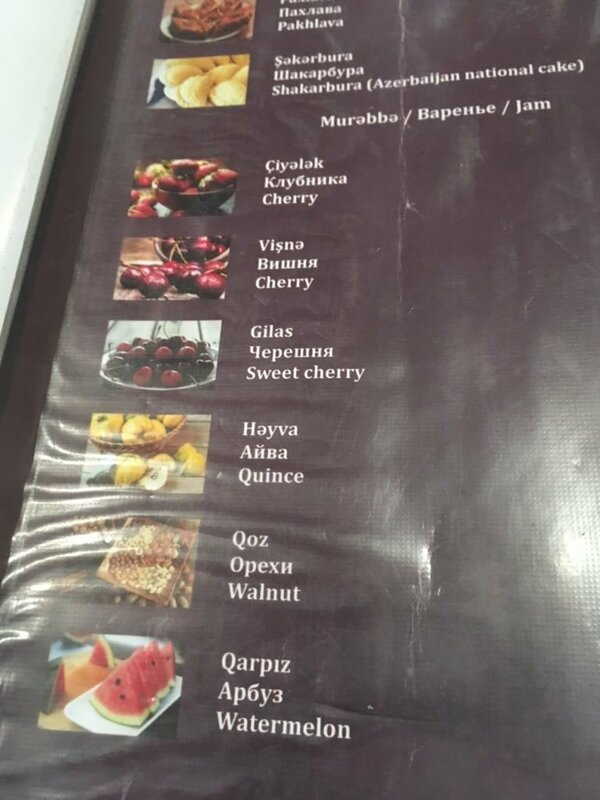 Posted in Azerbaijan, Next Door Restaurants, Outside DC	| Tagged Azerbaijan, Baku, dolmeh, gurza, next door restaurants, pilaf, qutabs, tandir	| Comments Off on Which ten restaurants would you most want to live next door to? One of the best ethnic restaurants in DC right now, and the best not-super-expensive place on the Wharf. Kaliwa offers Filipino, Thai, and Korean dishes, and the Filipino entries are the ones to get. They are designed and cooked by the same people who used to do the Filipino menu for Restaurant Eve, and the results are excellent across the board. The rest of the menu seems “good enough,” but not a reason to go there. I expect to return here regularly, and there are not many first-rate Filipino options around, given the long lines at Bad Saint. Definitely recommended. Wow. Word is this is from the people who brought you Panda Gourmet in DC. As a Sichuan place, it would be one of the region’s five best, but that is not even their real strength. For Xian food it is a clear first in the region. Get their soups, most of all the beef with chili and noodle soup (contrary to the name it is not spicy) and the lamb soup with bread. The Dan Dan noodles I found to be a slight disappointment, but overall this is one of the very best Chinese places around plus it has many dishes you won’t find elsewhere. Pleasant service, great prices, no downside here that I can see.